Guatemala (/ˌɡwɑːtᵻˈmɑːləˌ ɡwæ-ˌ ɡɑː-/ GWAH-tə-MAH-lə, GWAT-ə-MAH-lə or GAH-tə-MAH-lə; [gwateˈmala]), officially the Republic of Guatemala (Spanish: República de Guatemala), is a country in Central America bordered by Mexico to the north and west, the Pacific Ocean to the southwest, Belize to the northeast, the Caribbean to the east, Honduras to the east and El Salvador to the southeast. With an estimated population of around 15.8 million, it is the most populous state in Central America. A representative democracy, Guatemala's capital and largest city is Nueva Guatemala de la Asunción, also known as Guatemala City. The territory of modern Guatemala once formed the core of the Maya civilization, which extended across Mesoamerica. Most of the country was conquered by the Spanish in the 16th century, becoming part of the viceroyalty of New Spain. 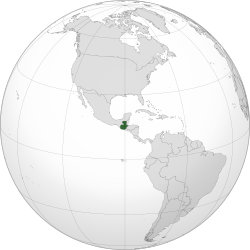 Guatemala attained independence in 1821 as part of the Federal Republic of Central America, which dissolved in 1841. From 1960 to 1996, Guatemala endured a bloody civil war fought between the US-backed government and leftist rebels, including genocidal massacres of the Maya population perpetrated by the military. Since a United Nations-negotiated peace accord, Guatemala has witnessed both economic growth and successful democratic elections, though it continues to struggle with high rates of poverty, crime, drug trade, and instability. Guatemala's abundance of biologically significant and unique ecosystems includes a large number of endemic species and contributes to Mesoamerica's designation as a biodiversity hotspot. The country is also known for its rich and distinct culture, which is characterized by a fusion of Spanish and Indigenous influences.